Bamburgh is a stunningly attractive small village set on the Northern stretch of the Northumberland Coast. It is without doubt dominated by its magnificently striking Castle that can be seen for miles around, giving the whole village a somewhat dramatic feeling. You can't fail to be impressed by the sheer scale of the Castle once you are up close and in the village itself. Look no further for Bamburgh pictures as we have an unrivalled collection. Sitting some 45 metres above sea level on a natural plateau of volcanic dolerite. The first written reference to a Castle here is 547AD and the Vikings destroyed the original fortification in 993AD. The oldest part of structure that can be seen now (the Keep) was built in 1164AD with stones quarried from nearby North Sunderland that were transported on horseback and by man power. 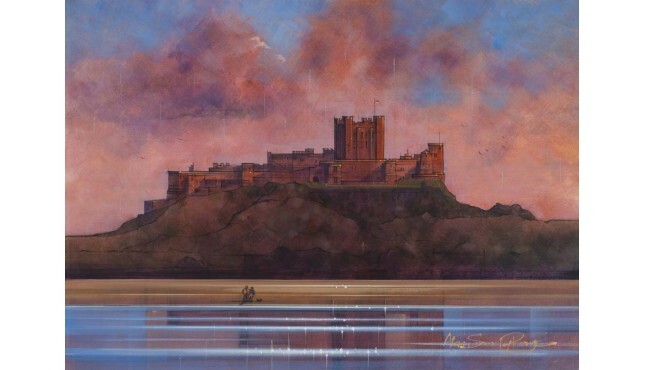 Find your favourite picture Bamburgh in our extensive collection of paintings and photographs of Bamburgh.